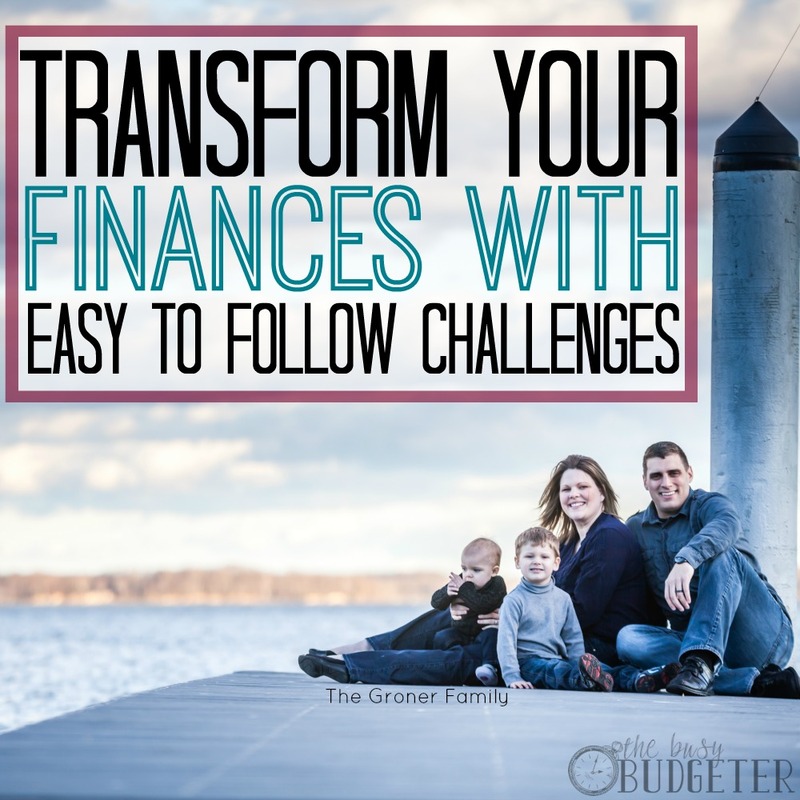 Transform your finances step-by-step with the easy to follow challenges! Make sure to join our closed Facebook group to ask questions, get clarification and get encouragment! No one on your friends list (unless they're also in the group) can see your posts or comments to the group making it a great place to go for help. These challenges are self paced. You can do them weekly, monthly, or in whatever amount of time works for you. The key here is not to give up. Your goal throughout the challenges is to do better managing your money this month than you did last month. That's it. Those small changes over time will completely transform your life. I know this, because I've done everything that I'm asking you to do. In the past 6 years, I turned my spender husband into a saver, reduced our spending enough to quit my job, made up my old income from home and learned how to live on a budget. We've come so far, and we're still going. The one secret to our success is that we never gave up. You literally can not fail at this if you don't give up. We’re diving right in this week and we’re setting up a basic budget. If you’re already using a budget tracker (something like YNAB, Mint, Every Dollar, Calendar Budget) AND it’s working for you… Then you can skip this challenge. For everyone else, we’re going old school with pen and paper. We’ll get to budget apps later. There’s an enormous benefit to doing it with pen and paper. With any budgeting app or program there’s a learning curve. Having a learning curve gives us a reason to procrastinate because it seems harder in our head than it is. This is easy. Anyone can do it. Go through the steps in the post linked below and set up your very basic budget then come back and comment here that you’ve done it. We’ll come back and adjust it, and fancy it up a little later. Putting a budget down on paper is easy compared to sticking with it. It’s particularly difficult if you don’t naturally have strong willpower. If you struggle with this, you aren’t alone! These are some tricks you can implement to make sure that you stick to your budget effortlessly no matter how many times you’ve failed budgeting before. You got it this time! Read the post linked below and figure out one of your triggers and make a plan to avoid it or lessen it. Budgeting isn’t just plugging in numbers to your budget. One of the things that most people don’t realize is that sticking to a budget is almost impossible unless you have routines in your life that support your desire to save money. We’re tackling the laundry this week. If you follow the steps in this post, you’ll never have to worry about getting behind in laundry again. Go through the steps listed in this post and make them happen. When you’ve done it, come back here and let me know you’ve completed the challenge. Now that we have our budget established and working, we have to worry about what happens when we go over it. Because that’s totally going to happen! Especially in the beginning. You have to realize that this is a new system that you’re learning. Getting upset at yourself for going over your budget makes about as much sense as getting mad at your toddler for throwing a tantrum. Neither behavior is desirable, but both are important steps to growing and gaining new skills. This week, I want you to read this post and commit yourself to not taking the easy way out. If you go over your budget, you’ll sacrifice something else to make the budget work. This is the challenge that can catapult you into AMAZING SUCCESS quickly. If you can sacrifice when you go over budget instead of just shrugging your shoulders and carrying on, then your life will change very quickly. As always, come on back here when you’ve completed the challenge to let me know. Okay, you guys are doing awesome! This week, we’re going to keep going with setting up routines at home that support our ability to save money. We’re going to establish a routine to make sure that we never get behind in dishes again. When we stay on top of the dishes, it makes it so much easier to cook at home, pack lunches ahead of time and say no to pizza delivery. As a general rule, the more you can cook at home, the more money you’ll free up in your budget to spend on things you really care about. This week, read the attached post and get a routine established for your dishes. This is it! This is the week that will give you the biggest savings to your budget. We’re establishing a basic meal plan this week and learning how to efficiently meal plan. You can save hundreds of dollars a month with careful meal planning. Having a few extra hundreds at the end of the month makes it easy to pay down your debt or afford the things that you really want. This week’s challenge is to read the post, make your meal plan, and make the commitment to stick to it! Remember our challenge in how to create will power when you don’t naturally have it. Plan ahead and try to figure out when your weak moments will be. This week we’re going to decide if you want to ditch your paper budget and get more advanced with a budgeting program. There’s absolutely nothing wrong with keeping your budget on paper… my goal is only that you keep the budget. You can chisel it into stone and I’ll be happy. Read through my 3 recommendations and decide if you want to try a budgeting app or stick with paper. If at any point you find yourself not using the app, stop and go right back to using pen and paper. Make sure to come back to this post to let me know that you’ve completed the challenge. Who feels like their entire family is out to sabotage their budget? I can almost see all the hands waving in the air. It’s almost impossible to try to save money if your husband isn’t on board. You’ll either be unsuccessful at saving money, or you’ll cause a lot of heartache and conflict in the marriage. Neither of these things are what we’re going for. So, this week we’re going to start having budget meetings. They’ll feel a little weird at first… A little formal, a little business like. Stick with it, through the first weird ones and you’ll find that this 20 minute weekly power meeting is the highlight of your week. Not just because you get to talk to your husband, but because you start to see the tremendous results that come from both of you working on the same goals. This week, read this post… Set up your meeting time and put it in your schedule. Commit to meet weekly.